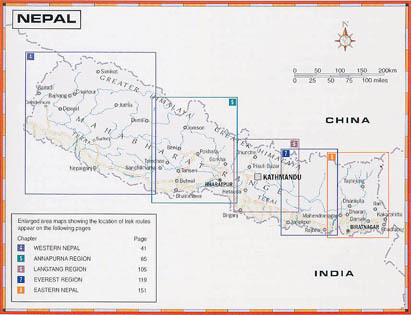 NEPAL is land lock country, approximately 800 Km (500 miles) long and between 90 (56 miles) and 230 Km (144 miles) wide, with an area of approximately 140,000 km square (54,686 sq miles). Its borders are with India to the south and west, Sikkim to the east and Tibet to the north. It is characterized by several east west chains of hills of increasing height. From the fertile plains of the Terai in the south, the country rises through the middle hills, to the greater Himalaya and the Tibetan plateau in the north. 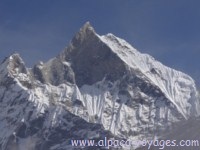 This represents the biggest altitude variation in the world, from less than 100m (328 ft) above sea level to the summit of Everest at 8848m (2902 ft.), the highest point on earth. Climate: The main factor governing weather patterns in Nepal, and indeed the entire Himalaya, is the monsoon from the Bay of Bengal. Carrying rain clouds that are the life blood of the entire Indian subcontinent, the air-current of the monsoon sweep across the land from the southeast and are prevalent through most of the summer season, from late May until early September. During this time it rains almost daily, with the southeast receiving the heaviest precipitation, and the northeast the lightest. The air is hot and humid, and trails in the hills turn into leech-infested quagmires of mud. 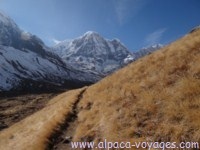 As the monsoon recedes in September the skies miraculously clear and autumn is the most popular season for trekking,. Visibility is then superb, and the weather mostly settled and fine. The onset winter in December brings bitterly cold nights and biting winds at altitude, but the country is sufficiently far south to ensure mild winter at lower elevations. It rarely snows below 2000m (6560 ft.). In spring the rhododendrons (laligurnas), national flower of the country, bloom, bringing a riot of color to the hills. However, after the long, dry winter there is dust in the air and this, combined with the increasing humidity and cloud build-up as the monsoon approaches, conspires to reduce visibility even at the higher altitude. Temperature: As may be expected, temperatures vary dramatically with altitude. As a rough guide, during March-April and October-December in Kathmandu and the lower valleys, daytime temperature can easily hit 30 degree C (86 degree F), dipping at night to a minimum of 20 degree C (68 degree F). 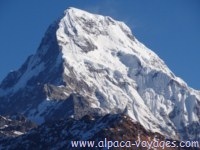 At elevation of 4000m (13124 ft.) the maximum day time temperature is 15 degree C (59 degree F) dropping to -5 degree C (23 degree F) at night; while above 5500m. (18045 ft.) daytime temperature barely attain 3 degree C (37 degree F) and may plunge to -25 degree C (-13 degree F) at night. When to go: The best time to visit Nepal largely on your tolerance & expectations, and on where you will be going. The peak season extends from September till the end of November when the post monsoon air is clear and dry, when mountain views are at their best and when neither the Terai (lower belt) is too hot nor the trekking regions too cold. 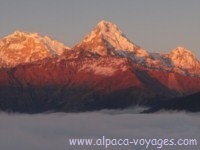 December, January and early February are the coldest months, especially at higher elevation and snow can limit trekking opportunities, almost all the budget hotels without heating can be very chilly. From late February and into March and April gets warmer with almost all treks again fully accessible as this season is second peak tourist season with appeal both fir trekkers and for travelers escaping the greatest heat of the Indian plains, but rising dust and haze at lower elevation can make visibility variable at this time. May & early June preludes of the coming monsoon, increasing heat, humid, thunder storm and the views become obscured by haze and clouds, the walk becomes strenuous and get too warm. Monsoon starts from the mid June till end of August and sometime can be stretched till mid September, the trail becomes slippery, the low cloud makes the mountains visibility poor and leaches are at everywhere. Due to rain the trail washed out or the landslides makes the road blocked. This is also the time for harvesting like planting rice and other things, one can enjoy the views of busy farmers in the paddy fields transplanting the corps form the dawn till dusk. This can be fascinating to those who are determined to do the trip despite of discomfort if heat, humidity and heavy rain fall. Today the population of Nepal is about 25 million, an alarming figure when compared with just five million in 1949 and ten million in 1960. The growth rate shows no sigh of slowing down. Tourism is the major source of income for the treasury. Around 400,000 foreign visitors are reported of entry annually whether it is by air or land. The People: With its variety of tribal group, Nepal is rightly called a melting pot. Essentially two different cultures meet in Nepal and dominate the life of the country. Sino-Mongoloid from north, with their Buddhist faith and Hindu Indo-Aryan from the south have intermingled and blurred the edges of these cultural and ethnic background and produced a wonderful, unique society in which the festivals of each religion are celebrated by the Kathmandu (capital of Nepal) valley, of which it has often been said that there are almost as many different temples and shrines as there are people. Language: Nepali language is the lingua franca of the country, most people in remote areas-speak it only as a second language. In total there are approximately fifty language spoken in the country. Ethnic Diversity: Brahmins: Belonging to the Indo-Aryan family, this tribe constitutes the priestly caste, which is the highest. Their specific duties revolve around taking charge of the many rituals. Most of the Brahmins live in the lowlands and valley and work as farmers. They are said to have migrated into Nepal after the twelfth century, when they were driven out of the Indian plains by invading Islamic people.. Chetris: Also Indo-Aryans, the Chhetris belong to the next highest caste. They live mostly in western Nepal and are farmers. They wield political power in urban areas. For generations, most of the prime ministers, generals, bureaucrats, and high military officials in the Shah Dynasty have come from this class. Mainly clans of Chetris are Ranas, Thakuris, Basnet and Thapa Rais and Limbus: These Mongoloid tribes live in mountainous areas in eastern Nepal. The Rai live between 1000m and 2000 m (3300 and 6600 ft.) altitude in a valley of the main river and tributaries of the Dudh Koshi and the Arun River. The Limbu live in the area 800 to 1300 m (2600 to 4200 ft.) altitude along the Thamur River just east of Rai tribe. The main body of Gurkha soldiers consists of four tribes: Rai, Limbu, Gurung and Magar. 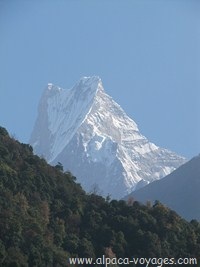 Gurungs are populated in the Annapurna region. Other inhabitants of the middle hills include Magars, Thakalis and Sunwars. Newars: can be encountered through out the country. These are either Hindu or Buddhist. Newars were originally inhabitants of the Kathmandu valley, and their skill as artisans is manifested throughout the kingdom in their temples and characteristic houses. Throughout the middle hills almost any where in Nepal Buddhist Tamangs are found. Tibetans: Known as Bhotaia The Tibetans live either in the farthest part of Kali Gandaki in the hig plateaus of northwestern Nepal or Dolpo, where trekking is only allowed after getting special trekking permits. They are also found in villages intermixed with the Sherpas. Their population is very small. Sherpas: In the high Himalaya Buddhist Sherpas living anywhere from Helambu to the border with Sikkim in the east beyond in fact, as many live both Sikkim and Darjeeling. 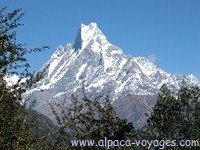 Their traditional homeland is the Khumbu, Everest region. They are also found near the upper watershed of Arun River on the south side of Makalu and the south side of the Rolwaling range. They also intermixed in urban areas and mountainous village with different occupational caste like Kami, who are blacksmiths; the Sarkis, who are leather workers; the Damai, who are tailors; and the Sunwar, who are gold and silversmiths. Visas: All foreigners nationals except Indians require visa to enter Nepal, available either at Nepal embassies and consulates overseas or at the airport/frontier on arrival. Visa obtained on arrival must be paid in US$ cash. A standard tourist visa for 60 days costs USD 30. But, this visa does not allow to travel some of the restricted area of the country. Traveling certain regions requires a trekking permits. Visa can be extended for one more month by paying US$ 60 either of immigration of of Kathmandu and Pokhara. Time differences: Nepal is 5 hrs 45 minutes ahead of GMT/UTC. Electricity: Nepal’s electricity supply, theoretically 220v/ 50hz, functions widely. Power cuts are frequent, though most major hotels in the cities will have generators. Note that a voltage stabilizer is essential if you are sensitive equipment like a laptop computer or television. Clothing: In low land shorts or light cotton/synthetic trekking pants are ideal, women may find skirt comfortable. But, very short skirt or revealing clothes are not suitable in the remote places as the villagers are not accustomed of seeing such. Cotton T-shirts are ideal in heat, though chilly when soaked in sweat at altitude. Thermal underwear is advisable for taking sweat away from the surface of the skin before it can perform its natural cooling function. Patagonia’s Capilene is a good example. Fleece fabric are quite usable and functions as thermal insulation as it trap a layer of still air inside. Gortex for outer layer is quite ideal as it is windproof, waterproof. Gloves, hats, socks are useful. If the trek is over 4500 m. one down jacket is essential and worthwhile taking. Sundry Items: Sunglass, Sun hat, sun screen, sewing kit, stuff sack (water proof), head torch, water bottle, pen knife, altimeter. Personal First Aid Kit: Insect repellent, Iodine for water purification, crepe bandage, cotton, thermo meter, Scissor, Eye drop, Aspirin, D-cold for cold, sun cream, lip cream, throat lozenges, Tiger balm or deep heat, Diamox. For exact date the current calendar is required.